Construction of Pakyong Airport, one of the highest in India at an altitude of 1,433 meters above sea level and perched 2 kilometres above Pakyong village, was scheduled for completion by December 2014. But as early as January 2013 it was reported that the challenging terrain might delay the project. The pace of construction was also slowed down by residents living in the vicinity of the project expressing grievances over negligence. More than ten families complained that construction work had led to large cracks appearing in their houses and the monsoon had sent debris flowing downwards from the site, causing havoc and ruining vegetation. Yet construction firm Punj Lloyd informed the media that if the project progressed as planned it would be complete by 2014. UK based geotechnical firm Maccaferri had been awarded the contract to carve the airport site out from the steeply sloped mountainside using ‘cut and fill’ techniques, moving earth from one place to another to create a level surface. One of the tallest reinforcement walls in the world, 80 meters high, was under construction to protect the airport from landslides. Pakyong Airport Affected Families Committee held a press conference on 11th August 2014 requesting the state administration to take the rehabilitation process earnestly and provide compensation to 165 families affected by construction of the airport. Some buildings had to be dismantled due to damage caused by airport construction works. Protest erupted in January 2015 when 135 families claimed their lives were at risk because of the threat of land slippage and sinking. On 9th January 17 families lost patience with repeated unfulfilled assurances from the Airports Authority of India (AAI) General Manager that their grievances would be addressed. They stalled building work, making a joint statement: “we will not let construction work go on without demands are met in physical state not a commitment alone”. Compensation for loss of property had only been paid to one-fifth of the 135 affected families; some had rejected the compensation offer, claiming that the property evaluation was unfair. They demanded resettlement along will full compensation for their property and one job at the airport for each of the affected families. Every monsoon season, since construction had commenced in 2008, had brought problems for people living in the vicinity of the airport, with many incidences of landslides and flashflooding. Downward pressure from the 80 meter high boundary wall has caused cracks in several hundred houses, many of which were dismantled after residents objected. The airport construction programme included amassing land and getting villagers to evacuate their dwellings. Initially, the airport site was 81 hectares. But the land area acquired for the airport had expanded, encompassing more and more cultivated land. 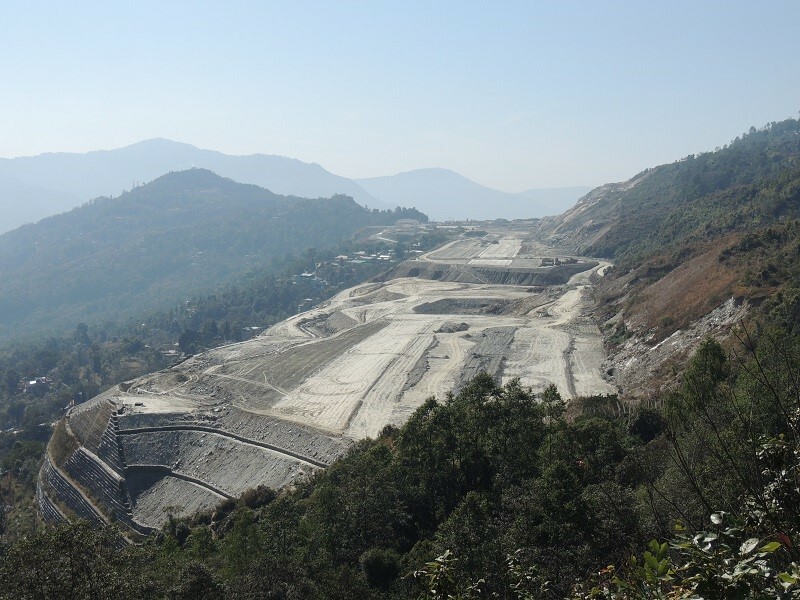 By the end of January 2015 Pakyong Airport site spread over 400 hectares. And construction had been brought to a complete halt since the beginning of January, as the protest by affected villagers demanding proper compensation and rehabilitation continued. In April 2015 it was reported that many houses around the airport premises had been destroyed or damaged during construction, while large portions of agricultural land had been rendered useless. 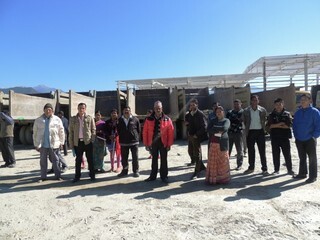 On 8th April a school near the airport site, immediately below the boundary wall, had collapsed. Fortunately nobody was injured as the incident took place at night. If the collapse had happened at night it could have been a disaster. Even though the school had been vacated a year ago, obviously unsafe with cracks the walls and foundation pillar, pupils still passed through the building to access classes being held in other buildings nearby. A study published in 2017 found that approximately 800 households were impacted by construction of Pakyong Airport; 250 of these households were categorized as ‘major impact areas’, located in the areas of Karthok, Dikling and Bhanu. Socio-economic impacts of the airport project included involuntary migration and difficulties accessing education following the collapse of the school. Residents of damaged houses who relocated to nearby settlements - such as Pachey, Pachey Samsing, lower Chalamthang, Lower Namcheybong and Upper Namcheybong - faced difficulties of adjusting to the new area, social inclusion and construction of new buildings. In some instances land compensation was delayed or ignored. Health problems due to Pakyong Airport construction works included reduced availability of drinking water, a dusty atmosphere, air pollution and noise pollution. In November 2017, as inauguration of the airport was expected by the end of the year, project-affected families persisted in demanding complete payment of building and land compensation along with proper rehabilitation and resettlement, saying they had been given a raw deal by the state government. An affected house-owner said “We were issued notices to vacate our houses, which were declared unsafe and a meagre amount was disbursed only as damaged [sic] compensation and not payment against acquisition of our houses and land.” Two advocates had been appointed by Sikkim High Court to ascertain the damages caused to two groups of landowners affected by the airport project. 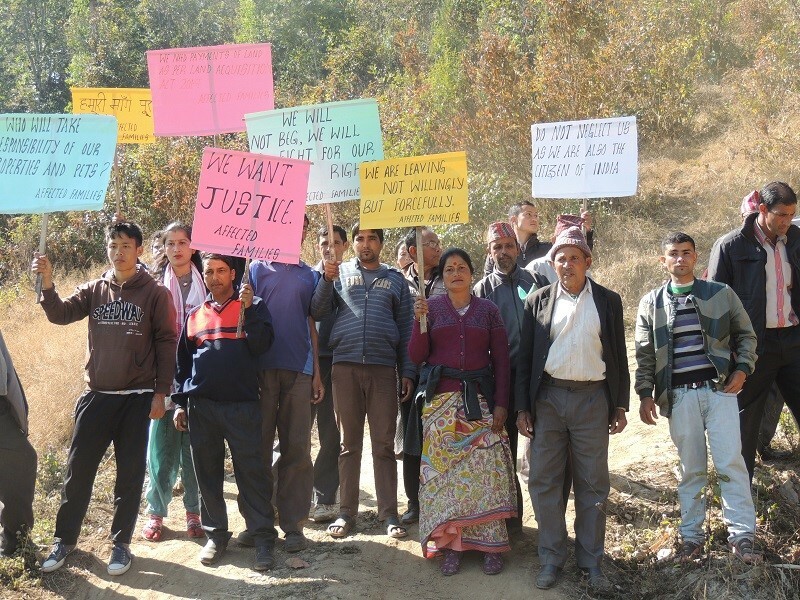 In November 2018, after Pakyong Airport had been inaugurated, more than 135 families were protesting delayed release of compensation by the Sikkim State Government for loss of their houses and property. They said they had lost everything and were living pitiful lives in rented houses. Since 2015 they had been running from pillar to post regarding their plight. Neither the state government nor the AAI took responsibility for payment of compensation or resettlement. The residents had appealed to Sikkim High Court and said if the outcome did not bring them justice they would hold a black flag protest at the airport. Runway work on the eastern flank of the airport had been stopped by aggrieved families. People living 400 meters uphill from the airport in Karthok Village were now being impacted by construction works, experiencing landslips and big cracks appearing in their walls. Sikkim High Court ruled in favour of the affected families. Over 350 farmers began an agitation in mid-November, saying that their land, amounting to about 121 hectares, although not officially acquired for project, had been rendered unfit for cultivation. Supported by the state’s leading opposition party, Sikkim Krantikari Morcha (SKM) they said protest would intensify unless compensation was paid following the guidelines of the Land Acquisition, Rehabilitation and Resettlement Act of 2013. The farmers moved to the High Court for compensation. An affected resident, one of two brothers, had been compensated for the damage done to their homes but nor for damage to their land, which had been their only source of livelihood. The brothers had grown organic vegetables and cash crops and reared goats and cows on land adjacent to the airport boundary. 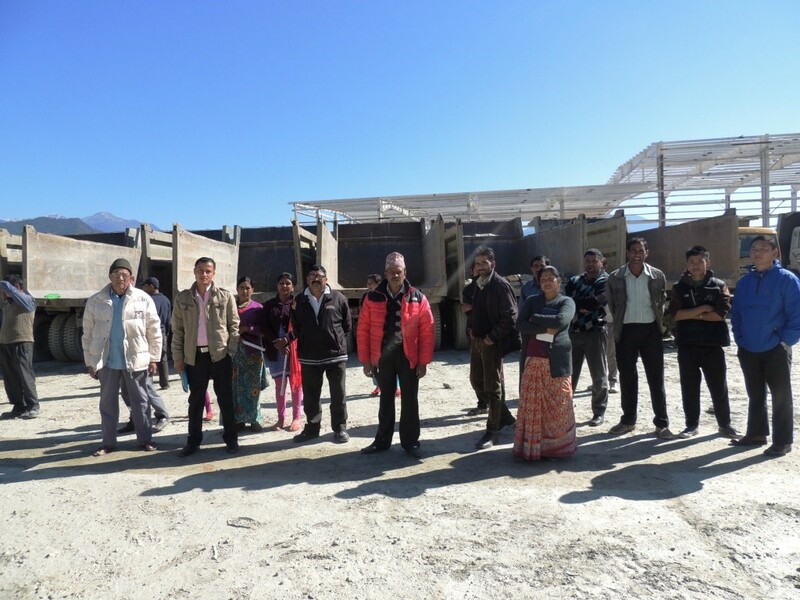 On 24th November about 30 affected families staged a protest at the main gate of Pakyong Airport, restricting movement of vehicles in and out of the site for about 30 minutes. The families invoked a five-day ultimatum saying if their demand was not met they would stage a similar protest. About 66 families were raising their voice concerning damage to their property and demanding compensation on a par with the latest regulations. The families said they would block work on the western flank of the airport, being undertaken by Geo Spar Infra construction company, unless Sikkim High Court announced judgement in their favour. Land acquisition issues remained unresolved in January 2019. 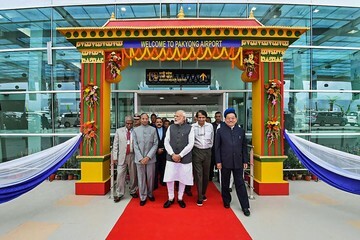 The Sikkim state government had passed the Sikkim Greenfield Airport, Pakyong) (Settlement of Claims for Loss and Damages) Act 2018 in order to resolve the issues but the government had yet to pay compensation to the affected families. Villagers said they would give the authorities until 25th February to pay remaining compensation before intensifying their protest. Parts of the boundary wall had collapsed a few months previously following heavy rainfall. Landowners refused to allow re-building of the boundary wall until those who gave land to the airport, along with those whose property and farmland had been damaged by construction but had not been included in the compensation list, were recompensed. Project Details Pakyong Airport, the only airport in the state of Sikkim, was built for passenger flights and defence purposes. Levelling the site for construction works involved carving a stretch of land 2.5 kilometers in length out from the steep mountainside. The foundation stone was laid in February 2009 by then Civil Aviation Minister, Praful Patel. Initially the airport site covered 81 hectares. During construction the land area increased to 400 hectares. Pakyong Airport’s terminal can accommodate 100 passengers and the single runway is 1,700 meters in length. Between 2008, when construction of Pakyong Airport began, and its inauguration in September 2018, the cost of the project escalated from USD 35.7 million to USD 85 million. In January 2019, four months after opening, the airport, hailed as an ‘engineering marvel’ due to the seeming success of its construction on rugged terrain, at an altitude of 1,433 meters carved out of a steep mountainside, was reported to be on the brink of closure. Many flights had been cancelled due to poor weather and the airport lacked the requisite Instrumental Landing System to enable operations in such conditions. The airport had only been operational for 20 days in October and 15 days in November. Problems continued in December when lack of navigation equipment necessary for the low-visibility conditions meant SpiceJet flights from Calcutta were diverted to Bagdogra on 21 out of 31 days, from where passengers faced the prospect of a five-hour car journey to reach Sikkim. A traveller questioned why, with Pakyong shrouded in fog for much of the year, a proper navigation system had not been factored into airport plans. Officials expected continued diversion of flights with even small drops in visibility. Furthermore, protracted suspension of flights was anticipated because a few months before Pakyong Airport opened the boundary wall built to protect it and particularly important for safe use of the runway had partially collapsed. On one side the wall was reduced to half its 80 meter height. 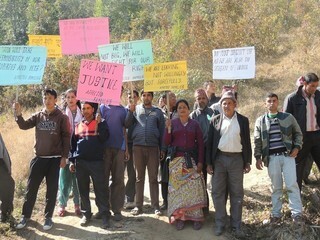 Construction works to rebuild the boundary wall were being blocked by protesting landowners demanding compensation. Why? Explain briefly. After Pakyong Airport became operational in September 2018 a number of residents impacted by construction were still protesting, blocking further work on the site and demanding fair compensation.